There is nothing like a steaming pot of hot soup to warm you up on a cold winter's day and this one does the trick. Deceptively simple ingredients cook into a robust vegetarian soup. Barley may be an even better breakfast choice than oats for persons with Type 2 diabetes. 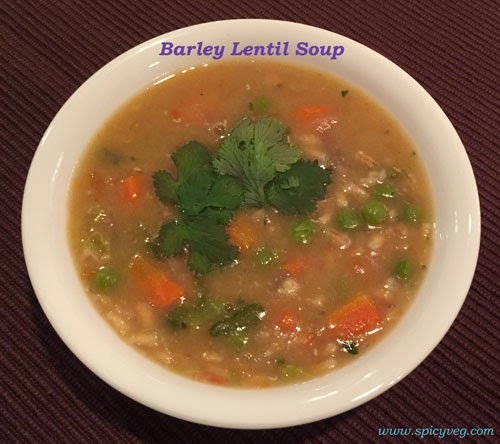 Barley is relatively low in calories, high in fiber and packed with vitamins and nutrients. Barley is nutrient rich and makes a satisfactory meal. It is packed with fiber and essential minerals. 1.Wash and Soak the Barley in hot water for an hour. 2.Add soaked barley ,masoordal, onions,greenpeas, tomatoes,caroots and salt to a pressure cooker or to a pot and let it cook. 3.If using a pressure cooker, just add enough water to cover the vegetables, and pressure cook for 10 minutes for up to 2 whistles. 4.When cooking in a pot, add all the ingredients to the pot and 3 cups of water, bring the soup to a boil, reduce the heat and cook the soup at low-to-medium heat for 20 minutes until the barley and lentils are cooked and the soup reaches the desired consistency. 5.Now add corainder powder ,black pepperpowder,cumin powder and boil the soup for 5 more minutes.Adjust salt.